Kuala Lumpur can be a rather wet place, getting much of both monsoon seasons. 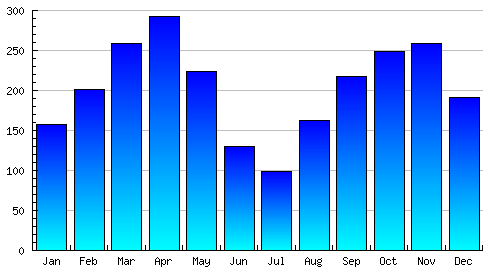 The wettest months are February to May and September to December. That said, you can enjoy a visit to Kuala Lumpur at just about any time of year. As with most monsoon climates, the rains come in heavy late afternoon downpours, usually leaving the rest of the day clear and dry. See the box at right for current conditions and the forecast below. Visit Weather Underground for more details. With its tropical location, temperatures are hot and humid throughout the year. Since it's getting close to the equator, there's not really any period that can be considered the 'dry' season. However, as in other parts of Southeast Asia, rains some in short cloudbursts, usually in the late afternoon. Plan your day accordingly, and you can enjoy a visit at any time of year.